Too many smashed fingers from little wooden mallets? Still hungry after an hour of prying miniscule pieces of meat from stubborn shells? Wondering why you are surrounded by a pile of dead carcasses? Well, sounds like you need to put the mallet down and learn how to make some crab cakes! I’ve been to my share of Maryland crab feasts. Sure, they are great for sitting around socializing and eating other things to fill up on; but lets face it, I want to have a full belly of crab. Maryland blue crab cakes can be made anywhere now, thanks to hand-picked cans of crab meat bought at your local seafood counter. This saves you a ton of time, not to mention the people who pick the crabs are much better at it than you or I (this means less shells to pick out of your teeth). 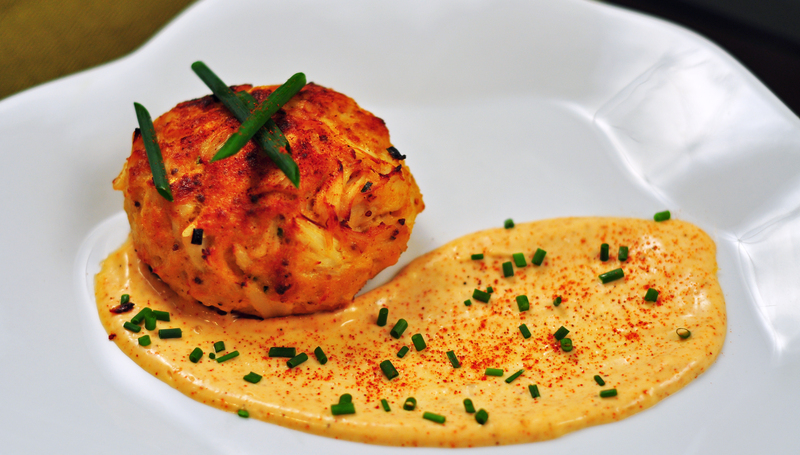 Recipe for Maryland crab cakes with chipotle lime mayo sauce. Good for 4 tennis ball sized cakes. Preheat oven to 450. Combine all ingredients except for the olive oil in a large bowl and gently toss to combine. Refrigerate for at least half an hour to let the flavors get to know each other. Scoop a handful of the mixture, gently form into a ball and place on a baking sheet lined with parchment paper. Bake at 450 for 15 minutes. Remove crab cakes and drizzle with olive oil. Fire up your broiler and broil the cakes until browned and crusty on top. Sprinkle extra chives on top and serve with chipotle mayo sauce. Combine all ingredients in a small bowl and whisk until smooth and incorporated. 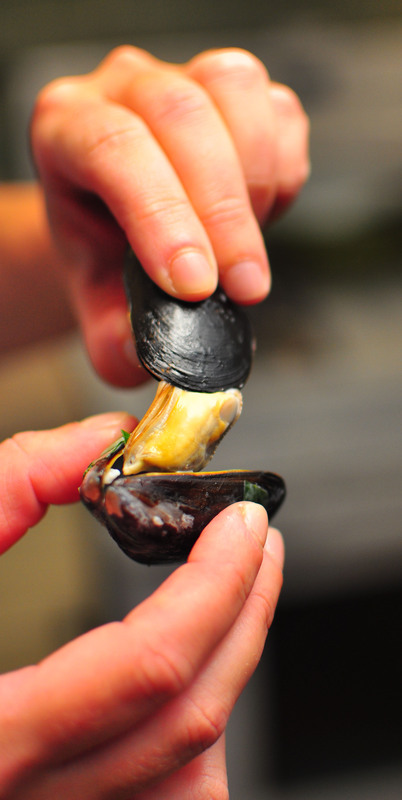 A classic, if you are going to cook Italian, clams linguini is a good place to start. 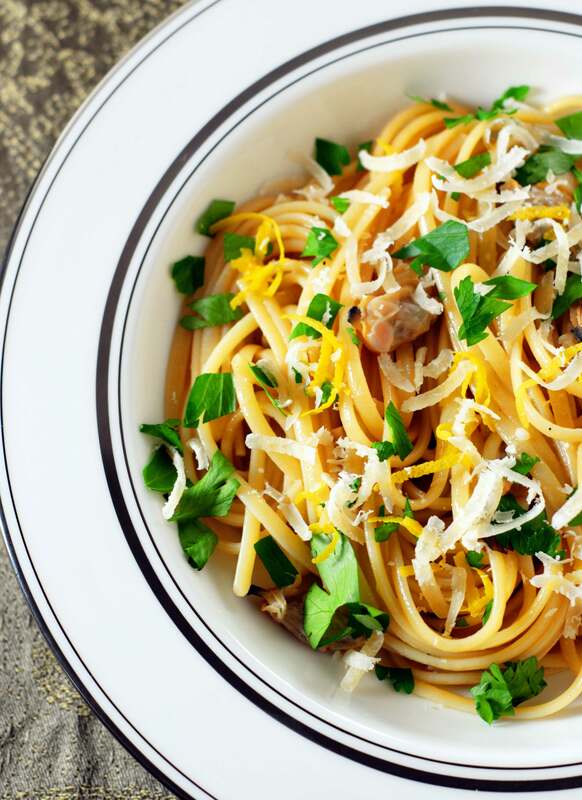 The flavors of clams linguini are simple to put together, yet complex when they are together and even better when the so called “balance” is achieved. You can screw it up easily, but as soon as you get it right, you will know. 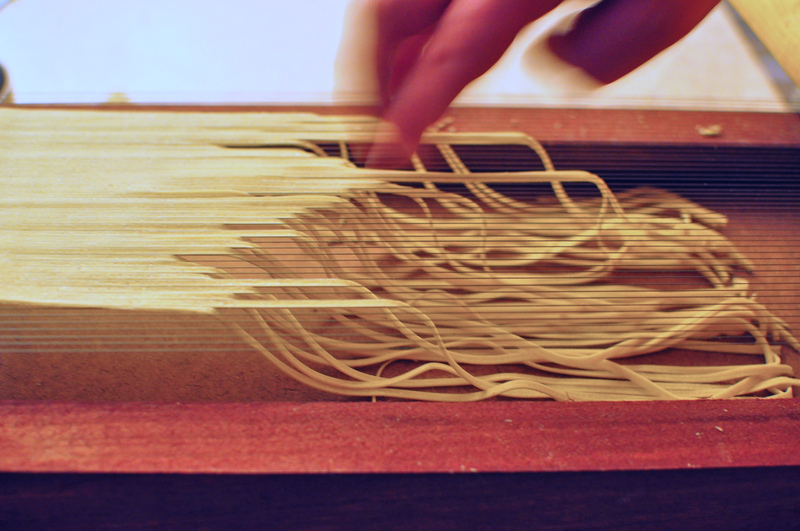 I first started making this dish with my chitarra, which is a wooden frame that has guitar strings stretched across it to cut out fresh linguini. With my recipe, I give you the option to use fresh pasta and fresh clams, or canned clams and boxed pasta. I’m sure you know which will be better, but convenience is an issue as we all have day jobs too. Either one batch of fresh linguini or a 1 lb box of dried linguini (you know which one will be better). 1. Get the water boiling. 2. Heat a large sauté pan over medium heat, add olive oil and red pepper flakes. 3. Once the oil is hot, add anchovies and garlic. Stir constantly until fragrant (about 2 minutes). Do NOT burn the garlic. 4. Add the clam juice and wine. Bring to a boil, then adjust the heat to simmer until reduced by half (about 7-8 minutes). Meanwhile, if you are using dried linguini drop it in the boiling water now. If using fresh, you want to only cook it for about 2 minutes and should wait until the wine is almost done reducing before boiling it. 5. Once pasta is al dente (slightly undercooked), and the wine has reduced, use tongs to add the cooked pasta to the sauté pan along with the lemon zest, clams, parsley and ½ cup of the water you cooked the pasta in. 6. Finish cooking the pasta by tossing with the tongs until the sauce slightly thickens and the pasta gets coated with sauce. If it seems dry, add more of the pasta water to “loosen” it up. 7. Garnish with extra parsley, lemon zest and lots of grated parmesan. 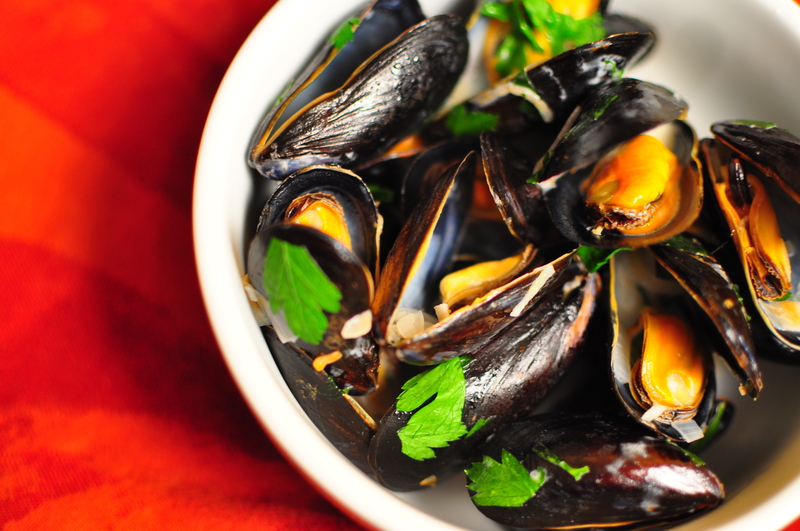 Bring 1 ½ cups of white wine and a handful of parsley to a boil in a sauté pan. Add 2 dozen clams that have been cleaned and close when tapped (still living). Once they open, pull them out of the sauté and put them in a bowl. I will not give a time for how long they take as it varies from the type of clam and the pan used, etc. If any don’t open, discard them. Shuck clams and their juices into the bowl. 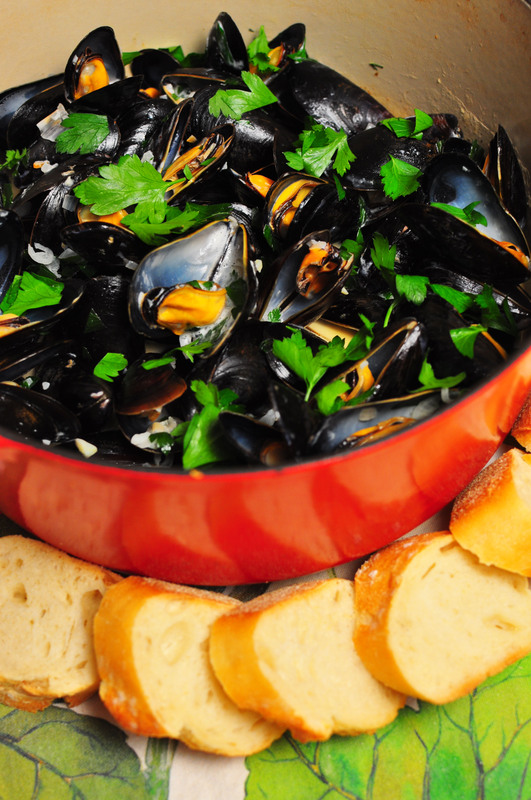 Add shucked clams, ½ cup of the wine you cooked them in, and whatever juice that is in the bowl into the sauté in place of the canned clams and bottled juice from above. Where do you get a good deal on a paella pan? The best (in my mind) kitchen store around. 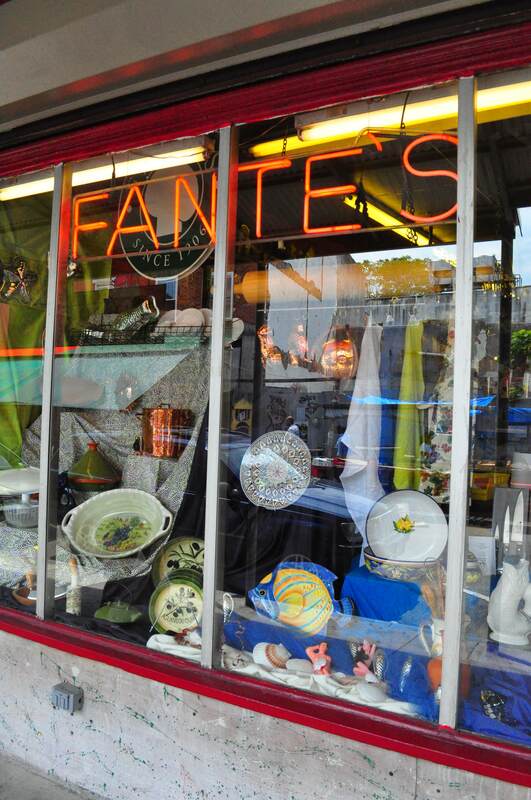 Fantes kitchen store, in the Italian Market of South Philadelphia is by far one of the coolest places I’ve been to in my culinary travels. Greeted by owner Mariella Fantes, she gave us a tour and shared some of the history of her family and the store. The Italian Market is the oldest open air market in the U.S. The streets are lined with produce vendors and great little shops that sell anything from freshly made mozzarella, to creamy gelato to huge barrels full of olives and other antipasti. So how does Spain fit into all of this you might ask? Well, one of my purchases from Fantes was related to a dish I had been waiting for a long time to try, paella. In fact, I bought two small paella pans for the purpose of entertaining and having the option of two different paellas at the same time. 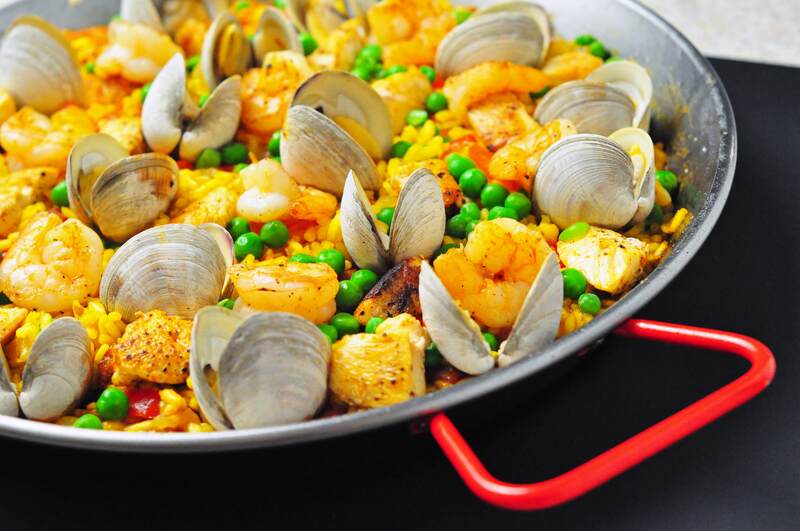 You could have one for seafood, which is traditional for the coastal regions of Spain, or keep the meat eaters happy with chicken and sausage. Paella is actually named after the pan itself. A low rimmed, wide cooking surface makes it easy to cook many different ingredients evenly. Original paella pans were made of terra-cotta, but now are mostly high carbon steel and stainless (which is easier to take care of). I made my first paella the day I got home with the pans. And it was all I could have hoped for! Topping the saffron rice with chorizo, chicken, clams and shrimp made it so every bite had its own character. Bring chicken stock to a simmer in a sauce pot and add the saffron. In the paella pan or large flat skillet, heat oil over medium heat, cook shrimp until opaque (about a minute per side), remove and set in a large bowl. Next, cook chicken and chorizo until done and put in the bowl with the shrimp. Add the clams to the simmering chicken stock and cook until they open @ 5 minutes. If any don’t open, discard them. As they open, add them to the bowl with the rest of your cooked meats. Add onions and red pepper and saute until slightly soft @ 5 minutes. Add rice and stir. Cook while stirring until the rice is slightly toasted, another 5 minutes. Add half a cup of the chicken broth. Simmer chicken broth until rice absorbs all of the liquid. Continue adding the remaining chicken broth (1/2 cup at a time) until the rice is cooked through, it should take about 30 minutes. A small amount of crust from burnt rice is not a bad thing either by the way. Once cooked, spread rice out evenly and top with all of your cooked meats. Cover in foil and put in a 350 degree oven for ten minutes.. Serve family style at the table. "Just cook the damn thing, would ya!?!" Growing up in the Midwest, I didn’t like seafood. No, let me rephrase, I didn’t KNOW seafood. Since I moved to the D.C. area 5ish years ago, I have found a whole new love in what I consider good food, even if it doesn’t walk around on land. Lately, a new craze has hit us in the D.C. area. Lobster rolls! We even have a lobster roll food truck cruising the streets of D.C. during lunch hours like some demented ice cream truck for adults. At 22 bucks average cost per roll around here, I figured I should give it a try myself, instead of spending what I normally would for a good filet that shows up on four legs. 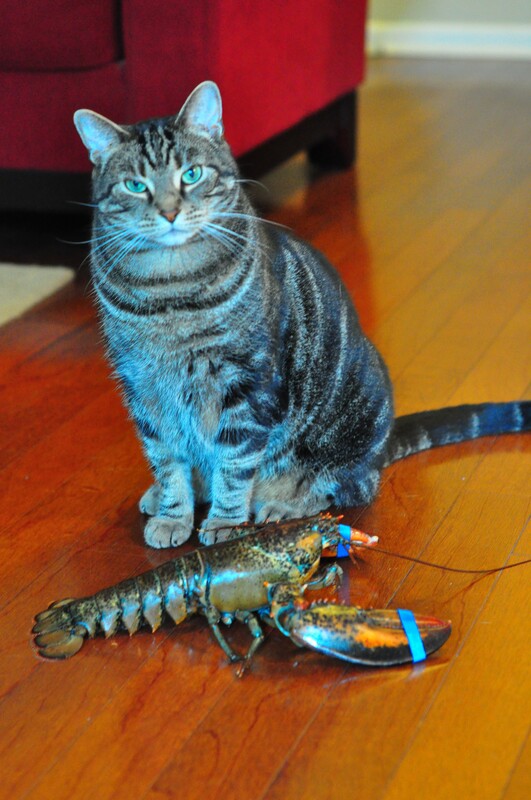 Keeping a keen eye out for when lobster went on sale, I decided to have one of those giant bugs plucked from it’s watery home and come over to my house for dinner, and to meet my cat, Duke, who also now likes lobster. A true, good lobster roll is very simple. Depending on the part of New England you might be in, there are family feuds over what goes in a good roll. And the big question is: butter or mayo? As in, what you toss the lobster with… I personally decided to go the mayo route as that is the type I’ve had, and liked. Other than that, a split top hot dog bun (I’ll get into that later), some lemon juice, paprika and a green of some sort. So, what is a split top hot dog bun? I have no idea. I know what they look like and taste like, but my local stupermarket sure doesn’t sell them. So instead… Get a full, unsliced Italian bread loaf. Slice pieces of bread that are 1 1/2 inches wide. Then take that thick slice you just made and cut it down the middle until about an inch from the bottom. Butter both sides and brown in a hot pan. Open the split and fill with your lobster concoction. Recipe for: Lobster rolls, two of them to be exact. In a large stockpot with a steamer basket in the bottom, add water until it is 2 inches deep. Bring to a boil over high heat and add the sea salt. Steam lobster for 8 minutes for a 1 1/2 lb, 9 minutes for a 2 lb. Remove from pot and let cool. Crack and remove meat from the claws, knuckles and tail. Put meat in a bowl and discard the body (unless you want it for stock). Gently toss the meat with half of the green onion, lemon juice, mayo and paprika. 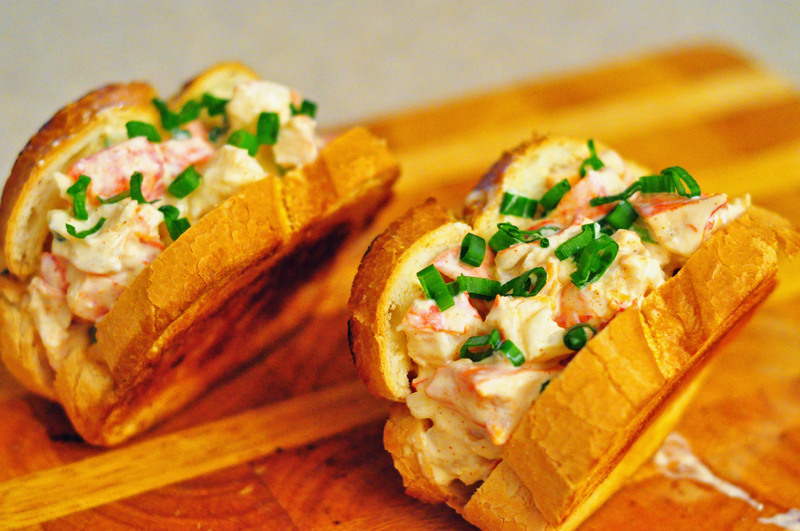 Load up your buttered and browned split buns with your lobster “salad” and garnish with the rest of the green onion. Serve with absolutely nothing else.